If you travel by air with your bicycle to Seoul, at Incheon International Airport there is a special luggage belt for oversized luggage. The airport employees are very helpful; don't hesitate to ask about your bike. Do not leave the arrival hall before picking up a free copy of the tourist map of Korea at the Tourist Information Desk of the KTO. This is one of the few places in the whole country where you can find a map in romanized script, i.e. readable for non-Koreans. Here is more info about Incheon International Airport. To get away from the airport, the easiest way is to use a shuttle bus with various destinations in and around Seoul and major cities, even as far as Busan. No problem to bring your bike, see point 2 below. There is a way to start your cycle trip right away from the airport. You can't use the main road over the Yeongjongdo Bridge but take the ferry to Incheon City instead. Follow the signs for "Wolmido" after starting from the arrival hall. For taking your bike on domestic flights contact the airliner. Rules tend to change regularly. Trains have poor facilities for bicycle transport. You will usually be allowed to take the bike on the train, but there is not really a suitable place on the train to put your bike. It may be a nuissance. A very good way to transport your bike in the country, is by taking a bus. 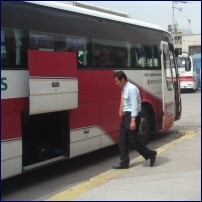 I mean the long-distance buses ("gosok bus") and the intercity buses ("sheeweh bus"). There is an extensive busline network of and they travel very frequently. The storage capacity for luggage is big on those buses (under the compartment) and in general there will be place for your bike(s). There is no extra charge. All cities and towns have a bus terminal. Just pronounce slowly 'bus terminal' when you ask your way; this is understood by Koreans. In the busterminals, travel information is not always available in English. Rely on the helpfulness of other travellers and the ticket selling employees. Koreans do not use maps very often, so don’t ask somebody to point something out on a map. Most Koreans will only be confused, as yourself. Since they don’t use them, few road maps are good, and few are updated. The best road maps are in the road atlases, which also have town plans. These are not so convenient for the bicycle tourist because they weigh a lot. What I prefer to do myself is cutting out the pages you will need from a 1: 100,000 or 1: 75,000 atlas and dispose of the rest. You will need also a smaller scale map for the general overview and for planning. Provincial maps are relatively good. They have scales, varying between 1: 150,000 to 1: 250,000. These maps are cheap (a few US$) and are sold in a carton folder. When you want to buy such a map in a Korean bookstore, ask the sales clerk for "Jee-Doh" (= map). Be aware that almost all maps and atlases are in Korean script (Hangeul). The Korean Tourist Organisation supplies a map of the whole country in English, at scale 1: 1,050,000. It is handy for the self-contained foreign traveller in Korea. This map isn’t available in bookstores. Pick it up at an office of the KTO, such as the one at Seoul's Incheon airport or any other international airport in Korea. On my first visit to Korea I wrote, in English, the names of major places that were on my route onto the Korean provincial maps. 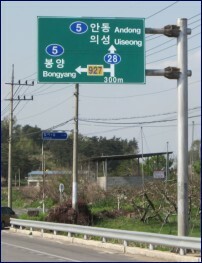 That proved useful, because all road signs use both a Romanized script (English) as well as hangeul (Korean). Traffic flows on the right and roads are wide. There's little reason for cars to push you off the road. Two dangers do exist: taxies and buses. Taxis ignore everything when they spot a customer. In their rush, they pull over to the right without first scanning the road. Buses perform the same careless driving manoeuver, careening toward a bus stop when they see people waiting. Always be extra alert whenever you see a bus in any situation. Bus drivers do not obey any traffic rule. Crossroads, in general, are spacious. Traffic lights are always on the opposite side of the junction, sometimes a hundred meters beyond the white stop lines where you must stop. Whenever a green traffic light turns yellow, stop immediately! Cross traffic gets the green light a very few seconds later. Given the huge dimensions of junctions, the poor cyclist has no time to escape. 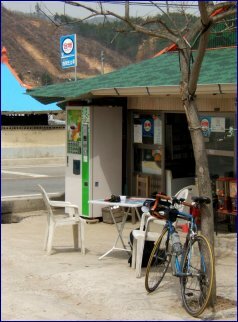 I have listed some survival tips for cyclists in Korea. Roads are numbered. A number on a blue oval background indicates a main road, a "National Road". These roads are often busy with motorized traffic, and thus less attractive for cyclists. Unless the main traffic flow has been diverted to nearby new highway, in that case the former National Road can be very attractive for cyclists. This is often the case when a new road is built around a town, where the old road passes through the town. Also in many places new roads were constructed through new tunnels and over new bridges. The subsequent old National Road is often deserted, while of excellent quality with gradients that never exceed 7%. 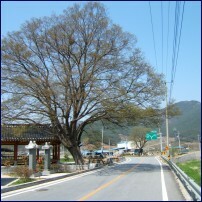 A road number on a square yellow background refers to a secondary road, or "jibang-do". Often these are excellent roads for bicycle touring. I strongly advise to plan as many as possible of those roads in planning a route. On maps those roads are often colored green or yellow. Motorized traffic has grown explosively in South Korea in the last decades, but it is stabilizing now. The number of registered cars was 14 million in 2005. That was about 4 times the number in 1992, and a hundred fifty times the number of cars (100,000) in 1969. As per beginning of 2012, there were 18.5 million registered cars, so the explosive growth has halted. Still, traffic jams are a problem, but where are traffic jams no problem where many people live? Korea’s car-dominated society offers little room for bicyclists and their bicycles. The bicycle lanes that exist along main roads are often snatched by drivers for parking lanes or used as sneak-through alleys to avoid traffic jams. Yet, cycling is not bad in a Korean traffic jam. The wide roads allow cyclists to pass idling cars. Traffic jams also pose less danger: no speeding cars! In most cities, bicycling is the fastest way of travel during rush hours. The few cyclists seen are poor people who can't afford a car. This creates a car-versus-bike mentality, as well as car-versus-pedestrian. As long as cycling (as a means of transport) is seen as a behavior of people in the lower social-economic class, it will remain trivial to most Koreans. There are changes on the way. Everywhere in the country new highways are still constructed on a large scale. This gives much relief to bicycle traffic, because the flow of traffic is in many places diverted from the traditional National Road through towns and villages, to a freeway for cars only. In many cases a National Road, a few years ago cramped with motorized traffic, has now become a beautiful, quiet and safe way for cyclists! Also, people are becoming conscious of the need of physical exercise and bicycling is a way to achieve that while combining it with transporting oneself and enjoying nature. Bicyling has outgrown the status of a child's play or a poor man's means of transport. The government has been stimulating bicycle travel for more than 20 years now, until a few years ago with little success. See the pictures in the interesting account of David Mozer about the results of these bicycle promotion actions. In several occasions, the situation in Japan has been taken as an example. While in Japan the people are used to cyclists among pedestrians, the Koreans are not. I think many projects have been a bad investment in bicycle promotion. see also About the Infrastructure for Bicycle Travel showing the poor results of bicycle infrastructural projects in the first decade of this century. Bicycle touring has got a major boost through the "4 rivers project" in 2012. This Rivers Restoration Project is a multi-purpose green growth project on the Han River, Nakdong River, Geum River and Yeongsan River. It included also the construction of long-distance bike trails. The project was spearheaded by president Lee Myung-bak. The restoration project's aims were to provide or improve water security, flood control and ecosystem vitality. It was first announced as part of the “Green New Deal” policy launched in January 2009, and was later included in the government's five-year national plan in July 2009. The government estimated its full investment and funding totaled 22.2 trillion won (Approximately 17.3 billion USD). 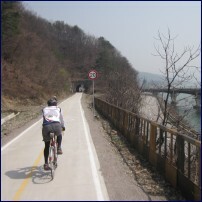 The official opening of the "sa-daegang" (=4 big rivers) bike trails was in spring 2012 and it has lead to an unprecedented explosive growth of long-distance bike travelling in Korea. Not only trails were established along the major rivers, also routes were set out (partly using existing roads, partly over new bike lanes) to connect the various river trails. 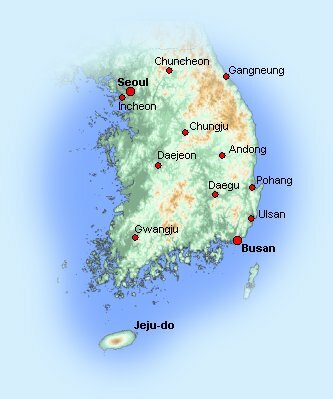 Thus it is possible to travel from Seoul to Busan all the way via a well signposted route, most of it leading over exclusive bike paths. Unfortunately, there is little online- and hard copy information about these trails in English. Also the official website is in Korean only. 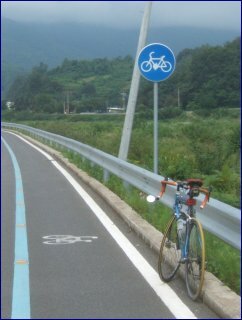 There is more information about the use of these trails in the Introduction on the page about the Bicycle Route between Seoul and Busan. There are many bike repair shops, even in villages, but most shops do not cater for sophisticated foreign brand bicycles. Professional bike shops, recognisable by the display of expensive MTB's and road bikes in the window, can only be found in the major cities. Professional help and supply of parts is usually not a problem in those kind of shops. Beware of stones and gravel on the road, especially in the mountains. It is essential to bring tools for repairing a flat tyre. Have at least one good rear light mounted on your bike. This will protect you in unlighted tunnels. Most tunnels are not forbidden for cyclists, but neither do they accommodate cyclists very well. You will feel safer with a reliable warning light. An important word for cyclists, especially in summertime, is "water". In Korean, it sounds like "mool", but more common is "saengsu", meaning bottled mineral water which you can buy everywhere. You can drink water from the tap (especially in mountain areas), but opinions are divided about this. Recently, even the healthiness of such bottled water has come under scrutiny and criticism in Korea. Public toilets are always found at public places like busstops and tourist attractions. Along the road, I advise you to go to a car petrol station, rather than to a shop or restaurant. Be so kind to ask if you may use the toilet (there is always one at petrol stations), I still have to meet the first Korean who hesitated allowing me to use the toilet at a petrol station. As a last, but very important advise to bicycle tourists, I like to say: Avoid big cities, busy highways and densily populated areas. The Korean countryside is a cyclist's paradise. Touring cyclists who love camping will be disappointed, at least if you merely want to count on your little tent when touring around. Koreans do go camping, but regard camping as adventurous and campgrounds are only found in national parks. Camping alongside the road for only one night is not done. The type of accommodation that can be compared with the "bed & breakfast" in western countries, is called a "minbak". You are supposed to bring your own linen and towels, but there will be no bed in your room. Most Koreans sleep on a sleeping mat on the hard floor. Staying in a minbak is a way to experience the Korean way of living. In the countryside staying in a traditional style minbak can be a wonderful way to experience Korean hospitality and friendlyness. "Minbak" is written as: . The most common kind of accommodations are motels. You'll find them in cities and in small towns, but also just along the road. In the cities, they tend to be concentrated in certain suburbs, the central part of town, or near bus and railway stations. Often you will find public bathhouses (saunas) offer motel facilities. 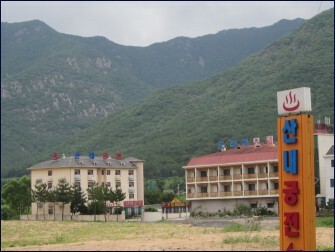 The bathhouses, and thus, in many cases, the motels can be recognised from a distance by the symbol: The Korean word for these motels, "yeogwan" is written as: . The price for one night varies between 20 to 30 Euro (US$25 to US$35). The motel provides you as a minimum: towel, shampoo, toothbrush and -paste as well as drinking water and a welcome small softdrink in the refrigerator. Also airconditioning and a TV set is standard, many motels have a computer with internet in the room. A cheap way of accommodation, albeit very comfortable, are the 24h saunas, or "Jjimjilbang". These are a modern version of the traditional Asian bath houses. The main purpose of this convenience is the bath (towels, slippers supplied), but it offers also space to sleep, although not in private rooms. They are considerably cheaper than motels. More upmarket accommodations can be found in hotels. Hotels advertise themselves mostly in English, so they're easy to spot, but you will only find them in the larger towns and cities. The hotel room is often not bigger or nicer or better equipped than a motel room. The difference is that the hotel has a lobby, reception desk and a restaurant and a motel has none of these. A hotel room in a big hotel will cost at least US$75. For those who want to experience a real Asian atmosphere, many Buddhist temples offer simple accommodations. Guest quarters are very simple and the monks will ask you about US$12 for a night. Remember that temples are not made for tourism and only enquire for accommodation after you made acquaintance with resident monks. The monk in charge of domestic matters is called the "wonju seu nim", pronounce "seu" as 'sir' without r.
Koreans have dishes and eating habits that differ from western and surrounding countries, such as Japan and China. Rather than discuss them in detail, read Lonely Planet - or other tourist guides of Korea. Be prepared for a few shocking adventures while searching for a good meal, from the viewpoint of a westerner. You might not enjoy live octopus, especially while its suction cups latch onto the insides of your mouth. If you are famished, or you have had enough adventures for that day, go straight to the pizza restaurant or other fast-food establishments. Such places are growing like mushrooms nowadays. In many small places, however, you won't find anything other than local restaurants. Korean food is very spicy. Start by sampling food from stalls along the road. Otherwise, find a restaurant filled with Koreans. Spy on what they are eating. To order, point to a dish that looks attractive to you. To order from the menu, most often written in hangeul, on banners hanging from the walls, is gonna fail for sure, even if the waiter tries to help. Too many differences in the Hangeul script compared to your guidebook, in explaining how food is cooked and in eating habits accumulate here and form an insurmountable barrier, all the more frustrating when you’re starving. For a nutritious pasta meal, ask for "Rah-myon" or "Oo-dong" - in both cases with emphasis on the first syllable. Many common restaurants, not the specialized ones, have this. It is a noodle soup. What I call a "common" restaurant, is one that has normal tables and chairs and a long list of items to order on the wall. But in the last few years, life has been made a lot easier for tourists who do want to experience Korean food, without being guided by a Korean. A type of restaurant called "gimbap cheon-guk" or "gimbap nara" is very popular among Koreans for a simple and quick meal. In most of those places, there is a picture of the food advertised on the wall, so that choosing because more than an act of Russian roulette. Another recent development that suits the hungry and thirsty cyclist, is the rapid expansion of the network of modern convenience stores. Chains like 'Family Mart', 'GS25', 'Buy the Way' and many others nowadays have also outlets in the smaller towns. 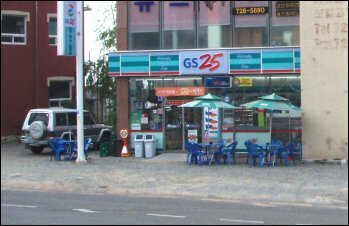 The convenience is that they are not only open for 24 hours per day, but also that they sell snacks and simple meals. There is always hot water (for your instant coffee, tea or ramyeon) and a microwave for your light meal to warm up. Often you also find tables and chairs to make your stop really convenient. Mountains dominate the Korean peninsula. If you're not in them, they form striking backgrounds. Along the West Coast are many plains. Along the East Coast, however, the highest mountain ridges rise into the sky. Here Road #7, which runs for a large part along the east coast, is spectacularly beautiful at some points. The highest passes tower about 3000 feet, most in Gangwon-Do, in the northeast. The mountains roads are cyclist-friendly, seldom with very steep slopes. A lot of earth moving is done in road construction to avoid steep gradients. Personally, I think the Korean landscape is one of the most beautiful in the world. It is particularly fine because of the continuously alternating scenery of forested mountains and rock formations. But I have to warn cyclists that are not well trained, that bicycle touring in moutainous Korea may be an exhausting experience. Korea’s overall temperature range throughout the year may be best compared with the northeastern USA. Despite its location at about 37?latitude, Korea sometimes has severe winters, with snow accumulating in the mountains. Koreans, as well as Japanese tourists, enjoy skiing at numerous ski resorts located throughout the country. Many roads are impassable for cyclists in wintertime because compacted snow on the roads turn into ice. High passes on small roads may be closed till the month of April. Icy roads are not treated with salt; at the best, with sand. Summer is short, hot and humid, with the rainy season in July. Don't trust this to always be the case. I’ve cycled in July and seen hardly any rain. From September to January, and April to mid-June, you have a fair chance encountering pleasant and dry weather. The best months for bicycle touring are September and October, when temperatures reach up to 24°C (75°F) with little rain. If your mobile phone is working on GSM networks only, it won't work in Korea. You can rent a mobile phone at international airports. Despite the explosive use of cellulars phones, public phones are still available in many places. Many public phones (still) take coins. There is only one type of public phonecard that works on all public phones (hurray for Korea!). Access to the internet is a widespread commodity in Korea, almost everywhere you can have access to wireless internet, but not always without having a subscription to a mobile phone company. But you will find internet caf? even in villages in the countryside and in many cases they are open for 24 hours a day. Such a place is called "PC bang", typically it cost you 0.70 Euro (US$ 0.90) per hour. To recognize a PC bang is easy: "PC" is always signposted in English. There are ATM machines everywhere, but only very few accept a foreign bank card or foreign credit card! Apart from some well known tourist centres you will only be able to get money out of an ATM in the larger cities and then only with the larger banks such as the Korea Exchange Bank. Then still you will only be successfull if the ATM is marked with "Global Access" or "Foreign cards accepted". From the several available ATM machines, one or two are marked as such. Changing money is not a problem with larger banks. Be aware that you can use your foreign credit card for paying only in a very limited number of places, like in international hotels and on airports. Without a Korean bank card, be sure to have enough cash with you, especially in the countryside. For more tourist information about Korea, go to the Lonely Planet site of Korea.